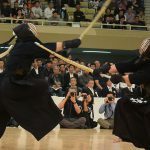 While kendo was banned during and after WWII, the Gyokuryuki Games (which had a different name back then) were also suspended. The last edition before the suspension in 1942, and the first edition after the resumption in 1955, were both won by Fukuoka Shogyo High School. They won again in 1956, and after missing out the following year, won 3 back-to-back titles from 1958. 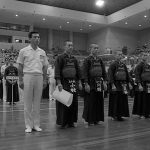 At that time, the number of participating schools had just surpassed 100. 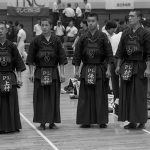 High school kendo was increasing in popularity, and 3 back-to-back wins at this time gained huge publicity back then, and its glory still lives on today. The star player that led Fukuoka Shogyo to victory in all 3 editions was Kenji Ikeda. 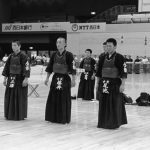 He now coaches boys kendo powerhouse Josuikan, which has achieved excellent results in national competition and is well known in the kendo world. 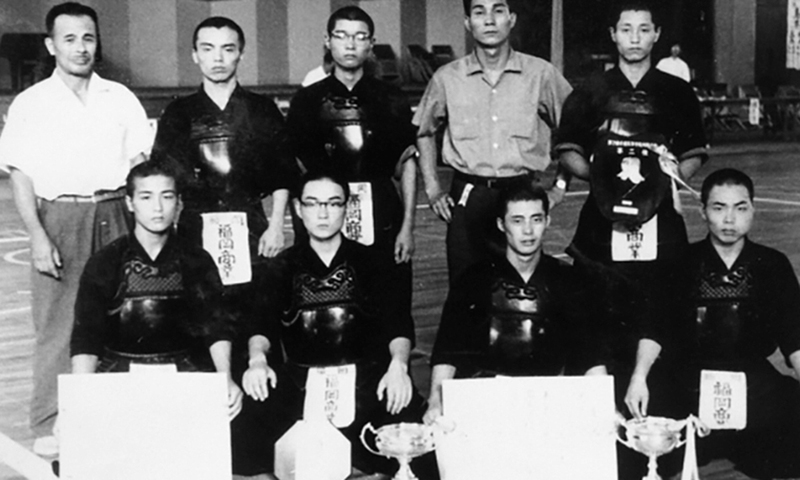 In 1958, 1st grader Ikeda took stage as Fukuoka Shogyo’s senpo, and swept 5 players in both the 1st and 2nd round. In the quarter-final against Oita Shogyo, he completed the 3rd 5-man sweep. The semi-final against Kunisaki-Aki (Oita) was called “the virtual final”, and taisho Mitsuaki Matsuda held firm to defeat two and move on to the final. In the final against Kaho (Fukuoka), Ikeda only claimed one win, but chuken Eiji Shiraki finished things off and led Fukuoka Shogyo to the top. 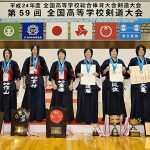 In the following year, Fukuoka Shogyo advanced to the final with Shiraki unused in all except the 4th round against Kitsuki (Oita). Ikeda, now the chuken, shined as a key player, noted by his 5-man sweep in the quarters. The final was, a expected, against Kunisaki-Aki. 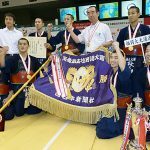 The match was even when the chuken players took stage, and Ikeda beat Toyoki Imatomi, then fukusho Yoshitsugu Tsutsumi, then taisho Masato Sato all in a row to claim back-to-back titles. In 1960, Fukuoka Shogyo took stage with 3rd grader Ikeda as the taisho. Jiho Kiyhonobu Kurakake and chuken Toshihiko Akiyama put in fine performances, and Fukuoka Shogyo reached the final without Ikeda being called into action. The final was, yet again, against Kunisaki-Aki, whose members were unchanged from the previous year. Senpo Masayoshi Takagi claimed the first win, but Kunisaki-Aki’s jiho Noshi Abe fought hard to run through 4 players, dragging out Ikeda in an utterly desperate situation. As Ikeda said “I attacked positively in order to avoid a draw”, and he claimed nihon wins against Abe, chuken Imatomi and fukusho Hideki Kono. Against taisho Sato, After first winning the kote he conceded the men, but finally he avoided Sato’s men attack and lunged into his men. At this moment, Ikeda claimed the first 4-man sweep in a final (at that point) and completed a tremendous comeback victory. In the inter-high games that year, Ikeda won the individuals, but Kunisaki-Aki beat Fukuoka Shogyo to claim the team title. Playing in white keiko uniform, Kunisaki-Aki was only a part time school then, and the newspapers named their style “jumping tactics”. They had strong players with great agility. This school later changed its name to Aki High School and put on fine displayers at the inter high games.